West Hills, Calif. (Jan. 10, 2016) — El Nino rains are coming, but our streets are not ready. Gutters and storm drains are clogged with leaves, which can lead to flooded streets and intersections. 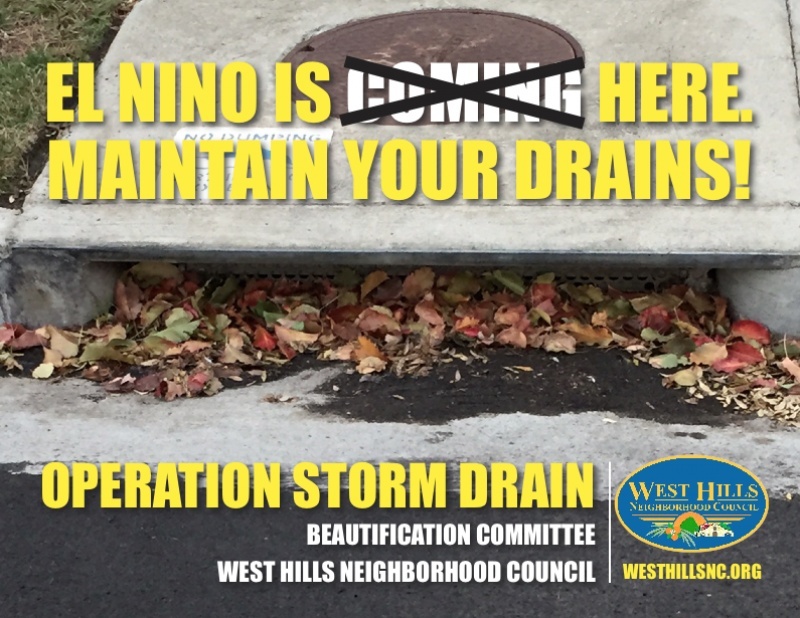 To prevent possible damage to homes and vehicles caused by flooding, the Beautification Committee of the West Hills Neighborhood Council has launched Operation Storm Drain 2016, encouraging local residents to assist in rapid storm drain clearance. “If you see a storm drain that is clogged with leaves, or if you see gutters full of leaves that could end up clogging storm drains as they are washed down the street by rain, we ask you to ‘clear it or report it,’” said Anthony Brosamle and Reeyan Raynes, co-chairs of the WHNC’s Beautification Committee. If residents cannot easily or safely clear a storm drain or gutter by themselves, they are asked to report it by calling 3-1-1, (800) 974-9794 or (800) 773-2489. Smartphone users also can use the MyLA311 app to report clogged drains and monitor progress on service requests. Be prepared to provide the nearest street address or a description of the location of the blocked storm drain. Step 1: Claim your block. — Work alone or with neighbors to note the storm drains on your street and monitor their condition. If any of them are clogged with leaves or other debris, see if you can safely clear and bag the debris for recycling. If you have access to a gardener or others who are able to help, ask for their assistance. Your entire block benefits when neighbors commit to keeping their storm drains clear. Please be safe. Beware of entering the street to clear a storm drain, especially at or near corners. If you are not able to safely clear a drain, report it by calling 3-1-1 or (800) 773- 2489, or by using the MyLA311 app. Step 2: Adopt a nearby block or route. — Working alone or with neighbors, select a nearby area beyond your block to focus on for clearance or reporting. It may be the major route nearest to your street. West Hills has many streets that pass by only hillsides, backyard walls, parks or other open spaces and are easily neglected. Note the location and condition of storm drains and request that they be cleared, if necessary. Step 3: Join a team to monitor a larger section of West Hills. — The Beautification Committee is forming teams of two to four stakeholders to monitor larger sections of West Hills. For example, one team may focus on Eccles Street and Chase Street between Fallbrook Avenue and Topanga Canyon Boulevard. Another may monitor Valley Circle Boulevard between Roscoe Boulevard and Vanowen Street. To volunteer for a team, contact Beautification Committee Co-chairs Anthony Brosamle ([email protected]) or Reeyan Raynes ([email protected]). Follow the WHNC on Twitter at @WestHillsNC or on Facebook at West Hills Neighborhood Council . All interested persons are encouraged to attend the WHNC’s board meetings on the first Thursday of every month at 7 p.m. at de Toledo High School, 22622 Vanowen St., across the street from Shadow Ranch Park. The WHNC’s Beautification Committee meets on the fourth Tuesday of every month in the first-floor conference room at West Hills Hospital.